Where Shaws Creek and the Credit River meet to form a unique habitat. Walk amongst many of the endangered and threatened species in our watershed. Learn about the Grange and why it is essential we protect this jewel. When we take one act and add it to the acts of others, we may not only be able to change our community, we may change the world. So even the smallest act can change the word. Experience the mystery of the forest and the healing sound of the river. The River speaks of gentler times, and reminds us of our link to nature. The Alton Grange Association [AGA] is a non-profit group of community volunteers that has a stewardship responsibility for the Alton Grange property. The AGA manages this 350 acre property in accordance with a Memorandum of Understanding with the Ontario Ministry of Natural Resources. It is one of two such arrangements in Ontario. What is the Grange Property? 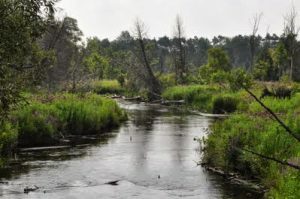 This 350-acre tract, adjacent to the town of Alton, is an environmentally significant property where two rivers, Shaw’s Creek and the Credit, flow south and converge. The Alton Grange contains an area of fragile wetlands, considerable areas of natural hardwood and mixed forest, meadows and open flood plain. When you hike the trails marked throughout the property, you can’t help but notice the diversity of the ecosystems ….huge stands of towering conifers, groves of maples and cedars, meadows, wetlands, several ponds and of course, the two rivers. The Alton Grange Association [AGA] is an incorporated non-profit group of community volunteers dedicated to the protection, restoration and enhancement of the Alton Grange property. The quality of the water in the river and the environment through which it flows are inextricably linked The Alton Grange Association believes that protecting this unique natural resource for future generations also means protecting the river that runs through it.